I'm a big to do list/day planner person. It's one of the things that helps me stay organized, and I use it as a way to assist with my depression and anxiety as a part of my cognitive behavioral therapy. In layman's terms, I use planners and lists to help manage my thoughts and feelings as a way to make healthier and safer choices for myself. I'm also big on writing things by hand. It helps me stay focused, and keeps me more grounded in what I'm doing. It's also cathartic when I can just write and write. In a way that's different than typing. While typing things out can help sometimes, writing it down by hand gives it more meaning and permanence, and helps me work things out a little bit better than typing. My old system, however, was starting to get a bit overwhelming, and I needed to find an alternative, and found bullet journaling. Trello - I use Trello to keep lists of media to consume. I'm big on media consumption—movies, television, games, visual novels, comic books, etc. Before using Trello, I didn't really have a system, and I became overwhelmed with things I wanted to try, or where I was in a particular season of a television show, for instance. Thanks to an episode of the Geek to Geek cast, I tried out making a list, and it helped tremendously to keeping me focused on what I wanted to look into, and made me feel not as guilty for possibly putting something to the side because I wasn't enjoying it. Google Calendar - Google Calendar is what I use day-to-day outside of my Plum Planner (more on that next). I live via my Gmail, and I use it as a way to keep my contacts and calendar organized. It's a good quick on-the-go tool for me when I need to add an impromptu work meeting, a get-together with a friend, or a therapy session. And it's easy to pull out my phone rather than my Plum Planner, which can get kind of unwieldy. 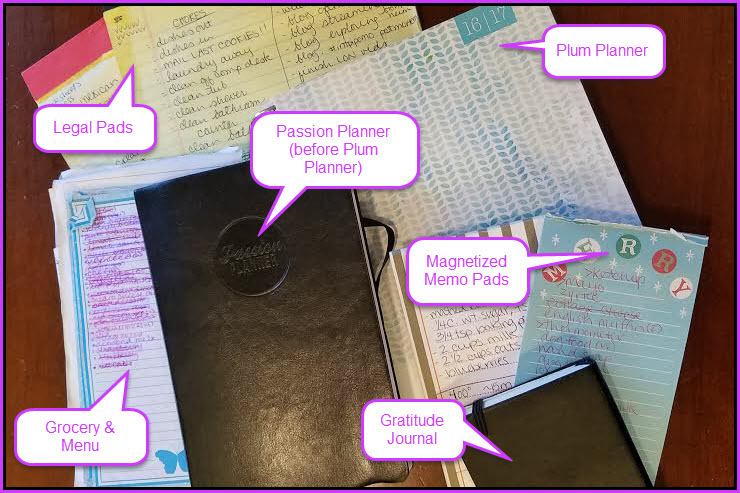 Plum Planner - I like paper planners, and I liked this one because I could keep (most) everything in one place. It had pockets to keep papers, to do list sections, menu and grocery planning sections. But, the more I used it, the more wasted pages it had because I wouldn't use a particular section one week, or I'd be using another one of my systems for a few days, etc. There were also the times when my sticky notes would get lost, or papers would fall out, and I wouldn't know where something went, and it was just too big to carry around casually in my purse. Sticky Notes - Sticky notes are my go-to "I need to jot something down to remember it now." sort of thing. Especially when I didn't have my Plum Planner around. But then they would get lost, or fall out of my planner, and it was never a good thing. Tumblr - As a part of my CBT, my therapist likes me to attempt to journal twice a week. About anything I want. It could be extremely personal stuff, or just general things that I would/sometimes did put in the blog. For the extremely personal stuff, however, I have a private Tumblr account where I could just let it all out. But, typing never really did it for me 100%. Gratitude Journal - As another piece of my CBT, I keep a gratitude journal. Just one or two things every day that I'm thankful for. Or that even just made me happy. I keep these in a small notebook by my bedside table. Legal Pads - I use legal pads like nobody's business. They end up full of to do lists, but then I have a difficult time tracking if it's a repeat task (things like dishes get done every day, so did I check it off yesterday or am I behind on dishes?!). And then sometimes I end up with random thought dumps, but then if I lose the pad, I lose the thought dump, and a lot of times those were half-written out blog posts. Magnetized Memo Pads - This one feels like a no-brainer for me. I keep magnetized pads and a container with pens (and a few things like coupons and my stamps) on the fridge. If I need to purchase something for groceries or I have a menu idea for next week, I jot it down. These then get torn off the fridge and used as my grocery list and a way to menu plan (which would then be planned out in the legal pads). As you can see, that's three digital forms of keeping memos, and five physical ways of keeping memos, all in different spots at different times of the day, with no semblance of organization. It was annoying to, for instance, need my grocery list because I was going to stop on the way home from work, but I wouldn't have it because it would be in a legal pad or on the refrigerator sitting at home. Or I'd make a thought-dump at work on my lunch break and forget to bring it home because my Plum Planner was sitting on the counter at home. Or I'd leave my planner at work by accident because it was too big for my purse and I had it out to jot something down. I think you can see where I'm getting with this. In an effort to simplify and keep myself organized, I wasn't really doing much of anything. And while it helped for a time, it started to just feel overwhelming. So I started looking for alternatives. 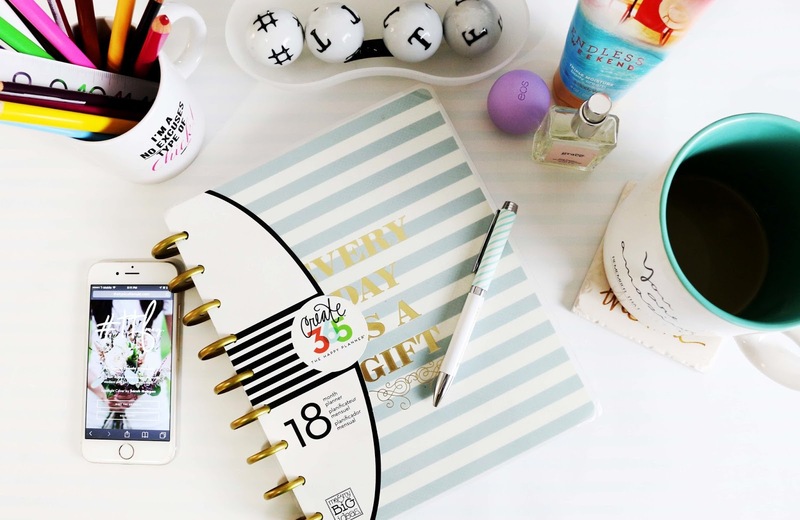 That's when I stumbled onto this thing called Bullet Journaling that I discovered through Jaedia, but have since found a few other bloggers that have made it a habit. I've only been doing it a month, but it's helped tremendously. I'll delve deeper into what it is, and how I bujo (bullet journal) in another post, however, or this one will become much too wordy.